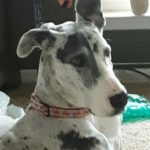 MAGDRL has a foster program in place where incoming Danes are placed in loving temporary homes where they are loved and treated for issues, while an appropriate forever home is located. Almost every foster home has other animals in it, so dog-aggressive dogs are very difficult for us to intake. 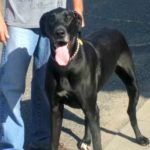 If an appropriate foster home is not available, we will sometimes have no other choice but to place your Dane in a kennel. MAGDRL is a matchmaker — finding dog savvy homes that have the right lifestyle for your particular dog. MAGDRL is asked to help many Danes and Dane mixes. Shelter and stray dogs are our highest priority. Our availability to help an individual dog is based on foster home availability, location of the dog, and temperament evaluation results. Accepted dogs may require a delay of a month or two until foster care is available. it is also possible that foster care may be available immediately, depending on resources and demand. We ask for a donation to help cover costs associated with rehoming your Dane, including any emergency or vet care that may be required. Please note: If you cannot afford to spay/neuter your Dane, please call us. We can offer low-cost alternates and, in cases of financial stress, may be able to assume this responsibility. The wellness check and routine (3 yr, not annually except for rabies) vaccinations should cost under $50. Neutering may be under $100 while spaying may be under $200–check the links above for low-cost programs. 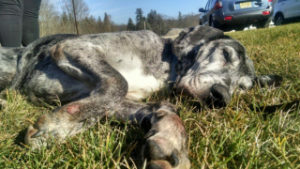 The sooner your Dane is vetted, the sooner the Dane can be placed in a loving permanent home. Please remember that we are helping you to place a dog. We are not profiting from you or your dog. Anything that you can do to help us place the dog only benefits your dog. Please note: If your dog has bitten even once, please do not put other innocent people at risk by not disclosing that information. MAGDRL CANNOT, for the safety of people just like you, adopt out dogs that bite. We can recommend other potential avenues for you and will try to be a resource for you — but don’t expect us to take a dog that has injured others. We take our responsibility to the public seriously and CANNOT knowingly risk injury to people. You shouldn’t either. Danes are giant dogs and giant responsibilities. Owner completes a short surrender summary form. This contains BASIC info. Additional information will be gathered during the course of the surrender. Intake Coordinator discusses the situation with the owner to elicit further details on the dog and the situation. During the conversation, the Intake Coordinator may suggest solutions to short-term problems or alternatives to surrender, and may provide information on contacting a trainer who helps with MAGDRL dogs or a local trainer in your area. If the Intake Coordinator believes the dog is a candidate for surrender to MAGDRL, she contacts a local evaluator with the dog’s information and requests an evaluation. The evaluator schedules and performs an evaluation, recording the dog’s reaction to a series of tests, and passes the information to the Intake Coordinator, who reviews the results and determines if the dog might be a candidate for MAGDRL foster care. The Intake Coordinator works with the Foster Team Lead to determine if foster care is available for the dog.If immediate foster care is available, the Intake Coordinator informs the owner and asks them to prepare for the surrender.If foster care will be available in the next couple of weeks or months, the Intake Coordinator works with the owner to determine if they might wait.If suitable foster care is not available, the Intake Coordinator will work with the owner to find alternative solutions, which may include kenneling the dog temporarily. This is a last resort, as Danes do not kennel well. 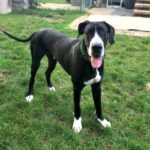 Prior to intake, the owner should take the Dane to a vet to make sure that vaccinations are up to date, spay/neuter is complete and a wellness check is performed (if financially possible). 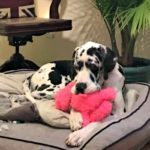 Find out about low-cost spay/neuter programs in PA& DEPlease note: We ask that you take the dog to the vet prior to intake because this dane is your responsibility–we’re here to help when you can’t any longer. We are a non-profit agency with limited funds–we don’t “make money” on any dog being surrendered. In addition, the dog will be more comfortable if this is performed by his family. In cases of financial stress, we may be able to assume this responsibility. We sometimes ask the surrendering owner to help with transporting the dog to the new foster home. If you can help, please let us know. The more you are part of this process, the more comfortable and less scared the dane is going to be. At the time of surrender, the owner signs the surrender form, relinquishing control of the Dane to MAGDRL. You will get one copy to keep and a second copy goes with the dog.